In Jemma’s world, there are no adults. After you reach a certain age, you die. All Jemma can expect is a life of scavenging and mothering, but she refuses to accept her destiny. When she runs away with her friend Apple and a mysterious boy, she finds out there may be a way to stop the deaths. To get the answers, however, she and her friends need to survive first. 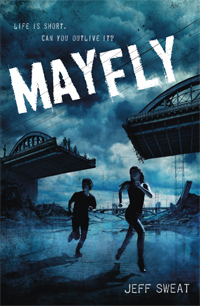 Mayfly is a dark yet hopeful YA dystopia, the first in a series. Author Jeff Sweat, a tech journalist and independent PR agent, is teaming up with Giphy to promote his book. We are happy to have him here on Book Riot. Mayfly is a harsh tale about a time when living seems impossible, that is living for the sake of living and not merely surviving. What inspired this dour world? I’ve always been obsessed with the end of the world. I grew up in the ’80s in the Cold War, and it wasn’t a question if the world would end, but when. As a reader and an author, I started looking for fascinating whys—why the world would end. Then I read a study that said that humanity had two major population booms: when we developed agriculture, and when we became old enough to have grandparents, at about age 30. Having “old” people around meant a memory to find food and water and avoid danger. It meant calmer heads to avoid war. So I asked myself: what would happen to the world if no one ever got old? We might survive, but civilization as we know it would cease to exist. We would lose technology, science, medicine, literature—all that made us human. And I knew that was the story I had to write. The novel toes the line between the fantastic and the scientific, providing rational explanations for the strange phenomena that occurs. What was it like toeing this line as Jemma explores her world? My original premise for the book was Lord of the Flies meets The Stand—the idea that when humanity is in distress, supernatural forces rise up to aid or torment the survivors. They’ve been there all along, but unique circumstances bring them to the forefront. But I’m not quite “magical” enough to go that route. I kept thinking about how magical even the simplest of technology could seem if you had never seen it before. A plane flying through the air? That’s magic. That’s why one of the most powerful gods of this new world is Teevee, because it spoke to billions of people around the world. Everything in this book has a scientific basis—our heroes just don’t know it yet. Not scientifically accurate, necessarily, but it was important to me that everything be scientifically plausible. Why did you decide to use GIFs as part of a marketing campaign for a dystopia? What was your inspiration? Book marketing is built on word-of-mouth marketing—getting the books into the hands of people who are likely to buy it if they know about it. But how do you reach people who should be fans but don’t know it? I wanted to try new methods to reach them. In light of how the world is, what do you hope readers will glean from the story? Dystopian writing, and speculative fiction in general, has always been lumped in with genre fiction. Which isn’t wrong, but it also minimizes how important speculative fiction can be. It provides a way to look at our own world through a completely new mirror. It lets us focus on one aspect of human nature—in this case, the importance of age to a stable society—and stretch and bend and twist it until we get a truer sense of who we really are. I’m less interested in the grim and futuristic aspects that can be a part of dystopian fiction and more interested in what it says about who we can become. I hope people walk away with an appreciation of the grace and strength kids have always had under pressure, despite how hard it is for them just to cope with their daily teenage lives. The dedication of the book says, “To the kids who hold the word together, whether they asked to hold the world or not.” I meant it to be a metaphor for the things we ask of kids all the time—to have to feed their families, to raise their siblings on their own, to deal with abusive parents. Then Parkland happened, and the metaphor became real. All of it made me hope that if something like this were to happen, the world might be in good hands. Jemma decides to try to fight for her friends’ lives and against the End, rather than to merely live. How much control does she have over her destiny? I don’t believe she thinks she has any control over her destiny—her decisions are based upon a desire to avoid the lot that this life has handed her. She has no interest in inhabiting the world she lives in, and her time as a Gatherer has shown her that humans used to have so much more. She has a secret belief that she won’t ever be happy unless she has the choices the Parents used to have. The key to Jemma is that she’s fundamentally fearful, doubtful and selfish, like most of us—but unlike most of us, that leads her to act in ways that are extraordinarily heroic and unselfish. She has no real hope of solving the End, but she hopes for answers, and she hopes to stall for time. She wants a moment of happiness in this world, something that will make it all matter. What was the most fun part about writing Mayfly? Constantly asking “what if” questions about how this world developed. What if the grown-ups died—what kids would be more likely to survive? What characteristics helped them to survive, and how would that form a new society? What pieces of their heritage would we still see in this world, and what would be wholly new? I loved writing any scene that let me look at my favorite place, Los Angeles, from the lens of a far-off future. I tried to juxtapose things that wouldn’t make sense in our world—the Hollywood Bowl turned into a mass grave, a monorail towed by cattle. During the writing process I would take my greyhound Roxy for night walks around my neighborhood where I could see LA monuments that appear in the book like Griffith Observatory and the Capitol Records building. No matter what, I would make sure I could get a view of the downtown LA skyline, which pops out of the ground like the Emerald City. It inspired me, and gave me a touchstone for how my characters would see those glimpses of distant grandeur. That quiet time walking with her allowed the creative thoughts to creep back in after a long day at work. What upcoming works can we expect? There’s a whole world left in Mayfly, so I’ll be going there first. I’ve just delivered book two, Scorpion, and there will be more to come. After that, I have a contemporary YA book based on my experience moving to New York for college, an independent film, and a comedy about a guy who wants to take over Hell but could only get a lease for 17 years. mayfly is out in Stores now. Be sure to pick up a Copy!